When people ask me for recommendations for gluten-free friendly eateries in Washington, DC my advice is simple: you can't go wrong with a José Andrés restaurant! As a city, we are lucky to be home to several of his inspired culinary concepts, including China Chilcano, Jaleo, Beefsteak, and Oyamel (can you tell I'm a fan?! ), which present globally-inspired flavors in a fun and whimsical way. His latest concept- Butterfly- is taking a test drive at the Navy Memorial-adjacent Think Food Lab. 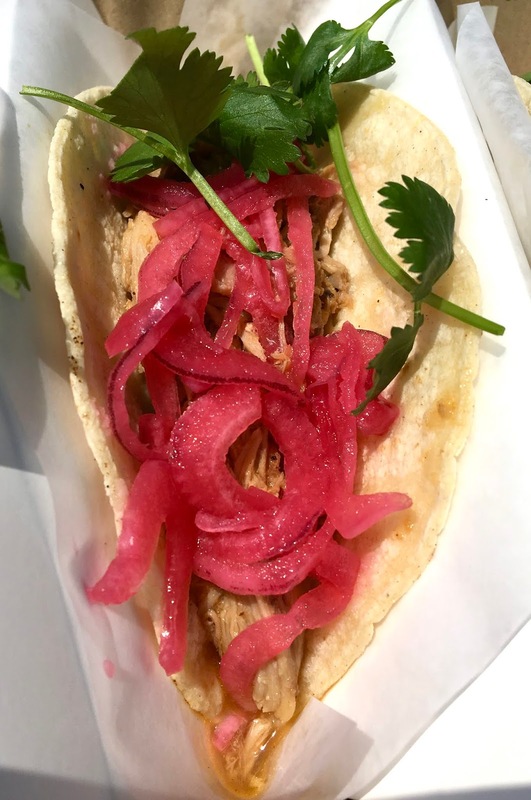 Part popup, part test kitchen, Think Food Lab allows the chef to experiment with flavors and foods while serving up fast-casual fare. 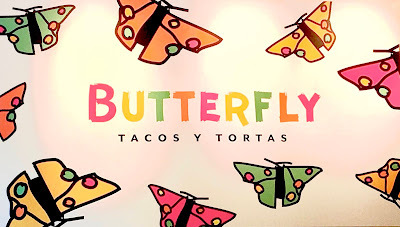 Serving up tacos, tortas (sandwiches), and salads, I'd say that Butterfly definitely has a bit of Oyamel in it's DNA. I couldn't wait to check out this welcome addition to the José Andrés restaurant family on my lunch break. Butterfly's menu is streamlined, with a handful of options under each category: tacos, tortas, salads, other things, and desserts. Gluten-free diners should steer clear of the tortas, as those use gluten-full bread. Chips too are off limits to gluten-free guests, as they are fried in a shared frier. One section with safe gluten-free options? Desserts. Pleasant Pops, supplies their popsicles, which are gluten-free (but some contain dairy). Because Butterfly was so crowded the day I visited I was not able to confirm all of the gluten-free options so as to not hold up the line, so I only asked about the two tacos I ordered: the chicken and pork. The cashier did have a list to check against, and when I said it was an allergy, she alerted the kitchen so they could take special care of my order. I ordered a taco trio, with two chicken and one pork taco, which came out quickly. The packaging of the tacos is absolutely brilliant, as it is easily portable and keeps the tacos separated and in shape (though they get soggy the longer they sit there so I opted to eat mine before heading back to the office. 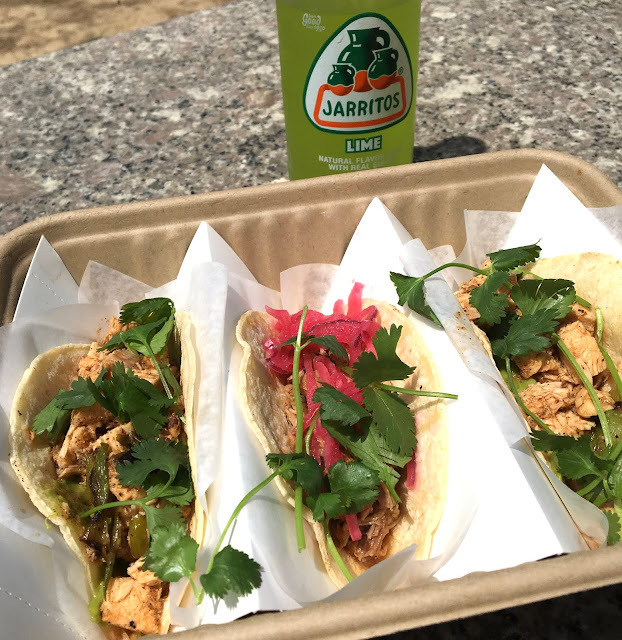 Although I do not drink sodas, I made an exception to order a Jarritos lime soda with my lunch because I just couldn't resist on a hot day. The tart sweetness paired perfectly with the tacos, and was refreshing without giving me a caffeine or sugar overload. The chicken tacos feature tender meat that has been liberally marinated, and cut into bite-sized pieces. Paired with a generous dollop of guacamole and a spring onion, I enjoyed the bold flavors and texture contrast. The pork taco featured succulent, shredded pork, which had a complex, spicy flavor. Tart pickled onions were a perfect contrast to the meat. Each taco not only met but exceeded my expectations, and all too soon I was sad that I had polished them off. I admit that I was totally biased going into this review but nevertheless Butterfly made a big impression on me. 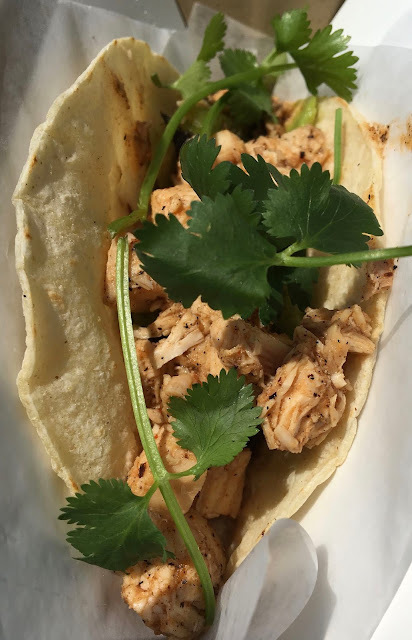 The flavors were so fun, and the construction of the tacos was flawless. A word to the wise: because of Butterfly's limited lunchtime hours it can get very crowded during peak rush. I recommend visiting when they open or late in the afternoon when it's not wall-to-wall people if you want to talk through gluten-free options or have other allergen concerns. But wait... there's more! Although Butterfly's stay at ThinkFoodLab will be temporary, the concept will be opening at Audi Field, D.C. United's new home (our Major League Soccer team).